Lock in a great price for Archview RV Resort & Campground – rated 8 by recent guests! Our cabin was situated among the scenic cliffs of Moab's desert with two full size beds and a refridgerator. 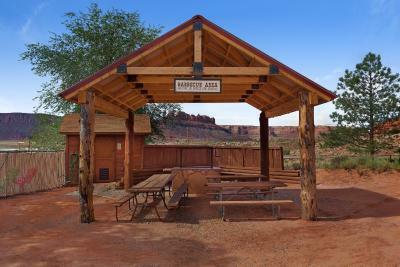 The campsite is located 7 minutes from Arches National Park entrance and nearly across the access road to Dead Horse Point State Park and Canyonlands. Linen is provided in room for self service in making the beds and the communal bathrooms, which include showers, were loacted a short distance from the cabin. Each site included parking, a picnic table and charcoal grill. We stayed in a deluxe cabin. Cute room. Clean. Bed was comfortable, a little too small for our liking. I stayed in a Delux cabin. It was adorable and cozy and exactly what I needed. I loved having my own bathroom and shower in the cabin. The location was great close enough to town to go in for meals etc....but far enough away to avoid the crazy crowds. This is our 2nd trip, this place is perfect. We will be back again. The staff are great, very nice. There is a laundry room and gas station on site. Loved the playfulness of the cute casitas. They were clean and even stocked with shampoo and soap. The shared bathroom was always clean and available for me. My husband and son had a hard time getting in once or twice. The casita we had reserved had a heater that wasnt working so they moved us to another one with no hassle. The staff is very friendly and personable. We will come stay again! The personnel were very friendly and helpful. Highly recommend! We absolutely adored our cabin! It was spotless, the bed was comfy and the AC was amazing after spending the entire day exploring the national parks. My husband is 5'9" and had no trouble with the shower height, though anyone taller might have to duck. Loved the location as well - right between Arches and Canyonlands and super quiet, but close to town if you need to pick up any essentials. We brought our own food so the refrigerator and microwave were great. After-hours checkout was a breeze. The basic cabin was more than we expected. Two comfortable beds with pillows and linens. It was nice to have the refrigerator. The bathrooms were extremely clean. Offering an outdoor pool, Archview RV Resort & Campground is located in Moab. A mini-market and gas station are available onsite. Free WiFi access is available in this camping area. Guests can park their RVs onsite, pitch their tents, or stay in one of the property's cottages. An outdoor dining area with BBQ facilities is conveniently provided. Views of the surrounding mountains can be seen from the campgrounds. At Archview RV Resort & Campground, guests have access to ATV trails on the property. Other facilities offered at the property include a children's playground. An array of activities can be enjoyed on site or in the surroundings, including hiking. If you feel like visiting the surroundings, check out Mesa Arch (6.8 mi) and Landscape Arch (7.1 mi). This camping area is 6.2 mi from Canyonlands Field Airport. When would you like to stay at Archview RV Resort & Campground? This bungalow has air conditioning, mountain view and flat-screen TV. Please note that this room offers access to bath and shower facilities that are shared with other campers. This bungalow features a patio, barbecue and dining area. This bungalow has a seating area, kitchen and barbecue. This bungalow features a microwave, flat-screen TV and private entrance. This bungalow has a sofa, dining area and kitchenware. Please note that this room does not include a bathroom. Access to private shared bath and shower facilities is offered. House Rules Archview RV Resort & Campground takes special requests – add in the next step! Archview RV Resort &amp; Campground accepts these cards and reserves the right to temporarily hold an amount prior to arrival. Archview RV Resort & Campground accepts these cards and reserves the right to temporarily hold an amount prior to arrival. This is a great place to stay! Close to the bike path, mountain biking, and jeeping. The staff was nice, the bathrooms were clean. We stayed in one of the smaller cabins and thought the place was perfect for our needs. Upon unfolding our blankets, we discovered they were peppered with dog hair. The communal bathrooms need another scheduled cleaning sometime mid-day to ensure cleanliness. The ladies in both the convenience store and conducting check-in were hospitable yet the gentleman was flatly rude. Very small. We wished they offered a king bed and more room to hang clothes. There was not a sink in the bathroom. A little noisy at night and early morning, but that’s to be expected when camping. It was really muddy but thats not Archviews fault! Mother nature has really poured out her blessings this year! When we arrived about 9, there was no staff helping us. Just a map on the door to tell us where is the cabin we booked. The cabin is nicer than I expected. Right next to the bath and restroom. The view around is spectacular. I couldn't believe hahaha!! The location was great, near both national park and of course also amazing dead horse point state park. Cleanness! Our room wasn't clean. There was lots of dust on the floor, the blankets were also very dusty. I get very strong skin allergy in this place. We were travelling for 2 weeks doing Grand Circle and slept in 7 different places and this was the only one when I got allergy. Location. Quick, easy access to numerous trails directly from campground. Noisy, noisy, noisy. If you're into listening to trucks on the highway all night long, this spot will suit you. If hard uncomfortable beds, tiny bathrooms and really nothing in the way of 'freebies' go, then this place might suit you. If not, seriously, go elsewhere. This place is overpriced and delivers less than it promised. 'Deluxe cabin'? I think not!!! Very glad we decided to stay in a cabin in arch view and not in town! The views all around you all day are amazing. From the casitas we had direct view on windows arches! Facilities private for the few casitas, all very clean, great choice!! Good position and nice room.